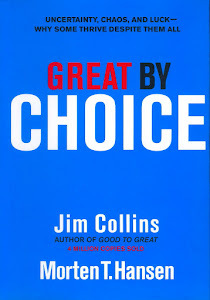 I'm a big fan of Jim Collins's books. He has a fascinating way of working, in that he and his team of researchers ask a big question, and then examine mountains of company data to try and find an answer. 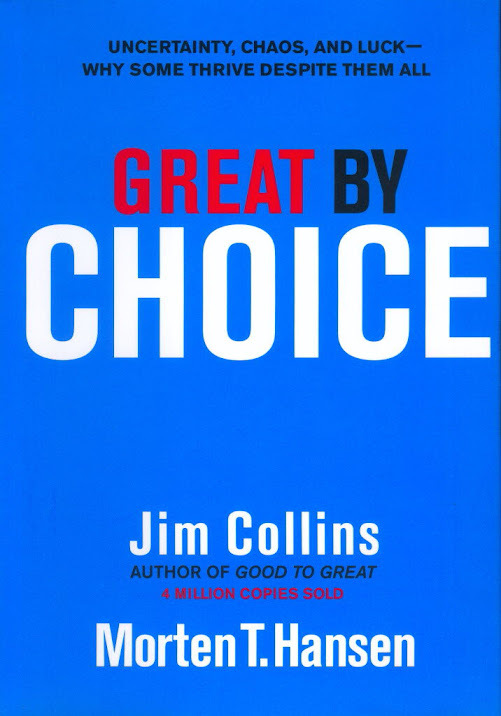 So for instance in his book "Good to Great", he and his team looked at what made the difference between good companies and great companies - what were the common factors which were shared by the great companies but were lacking in the good ones. Jim then has an incredible ability to take those results, and sum them up in easy to understand and remember ways which even people like me can grasp and put into practice. So for instance in Good to Great he identifies one of the differentiating factors as being "Level 5 Leaders" - leaders who lead with a combination of personal humility but steely resolve and passion for the organisations they lead. That sounds very much like how Jesus described leadership, and has been an inspiration for me as I seek to lead Kerith. In this latest book Jim looks at what causes some companies to do really well in times of uncertainty and chaos, and why others struggle or even collapse. He starts off with an analysis of why in 1911 Amundsen succeeded in his quest to be the first person to reach the South Pole, and Scott failed (quite hard to read as an Englishman brought up to think of Scott as a hero who could do no wrong). He then draws a whole load of principles out, illustrated by that story but underpinned by all of their company research. It's a superbly written book, nothing dry or dull about any of it, and I think the principles he brings out will become part of our language as we grow as a community. Concepts such as "the twenty mile march" (try and achieve the same amount every day, week or year regardless of how good or bad the conditions are) and "fire bullets, then cannonballs" (take small experimental risks before betting everything on what could be a big risk) have lots of relevance for where we are going as a church, and in particular as we develop a multisite strategy. I know that some struggle with whether we should apply business ideas to church life. For me it comes back to the eternal question of the tension between the soverignty of God and human responsibility. At the end of the day we know that it is only God who produces genuine growth, and that unless God builds the church we labour in vain, but at the same time we have a responsilibilty to create an environment where that growth can happen. If we can learn things from people like Jim Collins then it seems to me it would be sinful not to. So I'd encourage both business and church leaders to get hold of a copy of this book, and apply it to your situation. Also book in for this years GLS where you can hear Jim talk all about the book - more details on this to follow.